I have been involved continually with teaching university and church classes on the Israel & Palestine Conflict (IPC), both in the USA and in the Holy Land, since my first academic sabbatical in Jerusalem during fall semester 1985. Next year will be our family’s thirtieth anniversary of calling that tiny parcel of land in the Middle East a second home. Just this summer, after leading a two-week study tour with the Whittier Area Community Church, our group returned home on June 8, 2014. Most of us met a barrage of questions about “What’s really going on over there? Resulting conversations intensified when the latest surge of “Israel vs. Hamas” fighting erupted in the Gaza Strip shortly thereafter. In the American justice system witnesses are required to “tell the truth, the whole truth, and nothing but the truth.” This is designed to address one-sided testimonies that are technically “accurate,” but include only selected facts that favor one viewpoint. Such selective and often simplistic retellings of the history of the IPC conflict that intentionally leave out the perspective of the “other side” are far too common. While we don’t usually have the time or space to tell the whole story, we can make sure we balance representative aspects of the whole truth. 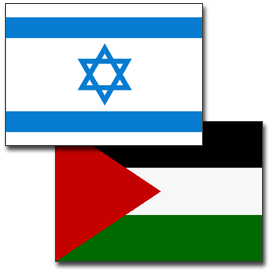 The modern conflict began in earnest during the early twentieth century when skirmishes between local Arabic people and immigrating Jewish settlers led the United Nations to propose a two-state solution: Israel and Palestine (1947). The Jews accepted the opportunity to establish a nation in their ancient homeland after the trauma of the Holocaust, while the Arabs rejected the forced loss of this portion of their modern homeland—especially Palestinians living in the immediate region. Israeli concerns continue to focus on their own national security within defensible borders, whereas Palestinians call for social justice, human rights, and a sovereign state of their own. Extremists on both sides want to eradicate the other, and have sought political, militant and/or military solutions in order to occupy land held by the other. Neither side has succeeded in accomplishing a lasting victory—let alone, a long-term peace. It is nearly impossible to pinpoint the start of the most recent round of aggression. Peace talks between the two parties have been stalled for the last couple years—each blaming the other for the lack of progress. Israel’s rightwing, Likud Party continues confiscating land in the West Bank, while Palestine’s militant Hamas party continues firing rockets into Israel from Gaza. During this past spring, tensions were high over a “unity government” deal within Palestine between the Fatah (moderate) and Hamas (rightwing) parties. In this heated atmosphere, three Jewish boys were found murdered (June 30) near a Jewish settlement in the Hebron area (deep in the southern, West Bank), for which Israel blamed Hamas. Shortly thereafter, a Palestinian boy was found murdered (July 3) in Jerusalem; then a relative of his was captured and beaten by Israeli soldiers that was caught on a You-Tube video that went viral two days later. In response, hundreds of Palestinians were arrested by Israel while Hamas has continued tunneling under Israel’s border and has rejoined their rocket attacks into Israel from Gaza. For the last month, the Israeli air force and army waged war against Gaza (beginning July 8), while Hamas continued to fire rockets into Israel. Yesterday (August 5) Israel withdrew its forces from Gaza under a 72-hour ceasefire leaving a total of 67 Israelis and 1,834 Palestinians dead—including hundreds of Gaza’s children and elderly. These disproportionate numbers surpass those of the previous Israel-Gaza conflict in the winter of 2008-2009. Both sides are now discussing peace talks once again. And so the cycle continues. Israel and Palestine are stuck in a deadly game of mutual blame and habitual retaliation, with many well-meaning Christians around the world choosing sides. Deep down, the question, “Who started it?” matters less than “Who will take the next significant and sustained risk to help forge a peaceful resolution that truly benefits both the Palestinians and the Israelis?” Making war takes a great deal of courage and sacrifice; making a just and lasting peace takes even more! First, God calls all human beings to a certain moral code, as the Jewish prophet Micah wrote to ancient Israel in the eighth century BC, “He has shown you, O mortal, what is good. And what does the LORD require of you? To act justly and to love mercy and to walk humbly with your God” (Mic. 6:8). Politically, “mere mortals” on all sides—far and near—need to incorporate much more justice, mercy, and humility in their agenda. Second, the small minority of Messianic Jewish and Christian Palestinian followers of Jesus living in the Holy Land must realize and renew their calling first and foremost as citizens of God’s kingdom (Dan. 7:13-14, 26-27; Luke 17:20-21; John 18:33-36). By doing so, they could seize a unique opportunity to be an important witness to the power of Christ’s resurrection in a needy part of the world. God is able—through his Spirit—to empower the church in the Holy Land to show a supernatural unity in the midst of persecution from both sides of the conflict. Finally, the rest of us who are privileged to call ourselves Christians are responsible to understand and represent this complex conflict fairly and graciously. Moreover, we should support in every way possible believing “peacemakers,” many of whom are “persecuted because of righteousness,” because they are “children of God” that are “blessed” by our Lord Jesus (Matt. 5:9-10). Final count then after three weeks of fighting was approximately 13 Israelis and 1,440 Palestinians dead, according to a report by the Congressional Research Service (CRS), “Israel and Hamas: Conflict in Gaza (2008-2009),” February 19, 2009.